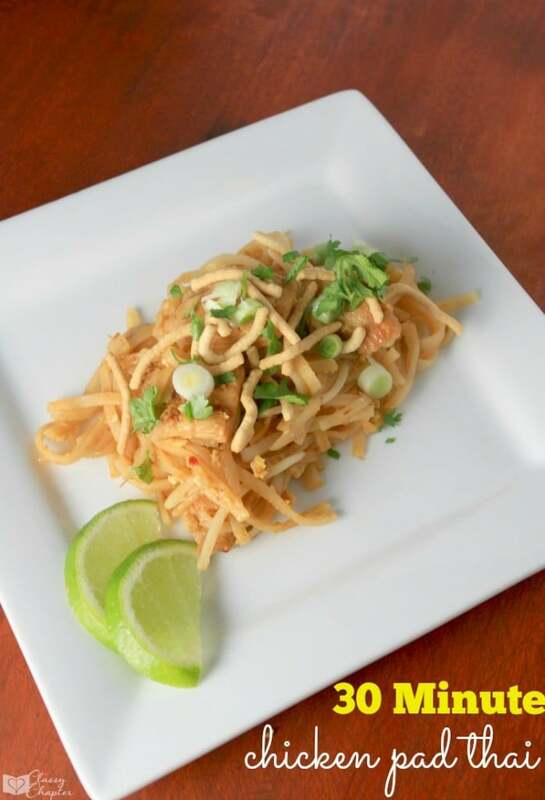 My husband loves chicken pad thai, but my original recipe takes me so long to make! I’m all about easy recipes for dinner so I took my original recipe and made a 30-minute chicken pad thai recipe. I hope you enjoy this easy home cooked recipes as much as my family does. Yes, even my little ones enjoy this dish. This chicken pad thai recipe is so yummy and easy to make. Packed with flavor it’s sure to please even the pickiest eater. Combine soy sauce with cornstarch in a medium sized bowl add chicken and toss to coat. Bring a large stockpot of water to a boil and add rice noodles. Let the rice noodles boil for 8 to 10 minutes. While noodles are boiling heat oil in a large skillet or wok with 1 tbsp. of oil. Add in garlic and stir-fry for about 30 seconds. Add in chicken and cook for 5 to 7 minutes over medium-high heat. Add in a little chicken stock as needed to ensure chicken stays moist. While chicken is cooking, drain the rice noodles, rinse with cold water and set to the side. In a small bowl mix together Pad Thai sauce, fish sauce, rice wine vinegar and chili garlic sauce. Add the sauce to rice noodles and combine. Add eggs to the chicken and cook for 2 minutes, mixing the eggs in with the chicken. Serve with chow mein noodles, cilantro, green onions and lime. 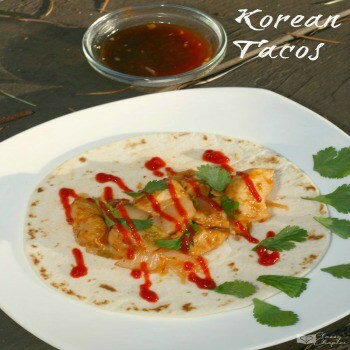 If you enjoyed this recipe, make sure to check out my Koren Taco Recipe below. That looks good, and I’m all about easy too. I don’t mind cooking, just don’t like complicated dishes lol. This looks right up my alley. I love meals that are quick to prepare but still delicious, this looks spot on! Thanks for linking up to Sweet and Savoury Sunday, stop by and link up again. Have a great day! !